Roosevelt comments on a manuscript detailing, step by step and minute by minute, the assassination attempt made on his life on October 14, 1912. He corrects the common misperception of what he said about the assassin when shot – “Don't hurt him. Bring him here. I want to look at him" and discusses both the nature of his wound, and its effect on him. Typed Letter Signed (“T.R.”), with one autograph correction, 2 pages, quarto, on the letterhead of “Office of Theodore Roosevelt,” The Outlook, 287 Fourth Avenue, New York, February 5, 1913. To Sturgis Bigelow in Boston. With Manuscript, in unidentified hand - but most likely Bigelow's - amended in autograph by Roosevelt; 2 pages, quarto, no place or date. 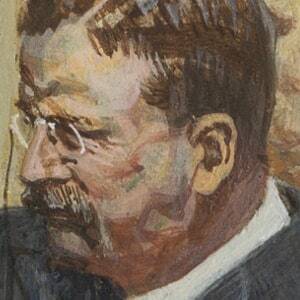 Despite Being Shot, Theodore Roosevelt is, Reportedly, "Hearty as a Bull Moose"
Ethel feels that her late host is the very nicest of all nice persons! So do Ethel's papa and mama. She is a dear, and you and all your household have done everything for her. Will you tell the household so, by the way! stiff next morning. This all tired me a little, and when I lay down in my bunk my heart was again beating fast enough, and my breath was short enough, to make me feel somewhat uncomfortable. But after a while I found I could turn, if I did it very carefully, to my unwounded side, and then I fell asleep. 12. here - I want to look at him." 15. he knew him. Did not. 16. Tried handkerchief at mouth. as loud & as long sentences as usual. 31. drunk he did not know he was shot?"